A breakout of Swine Flu has been reported in Mexico and cases of Swine flu are also now been reported globally. Swine flu causes fever with the body temperature rising to greater than 100 F (38.0 C). Other symptoms may include headache, an overall feeling of discomfort, and body aches. In light of this various countries are considering or are deploying or carrying out trials using infrared as a scanning technology to detect persons with elevated temperatures which may be the result of Swine flu. 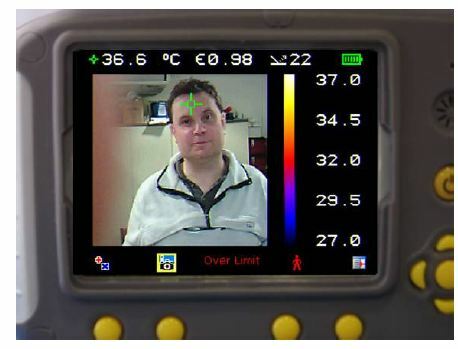 Produce infrared or "heat pictures" of a human face by utilizing an infrared camera and based on these thermal images provide surface temperature measurements. Indicate if a user defined threshold temperature is exceeded. (Say 37 Deg C). 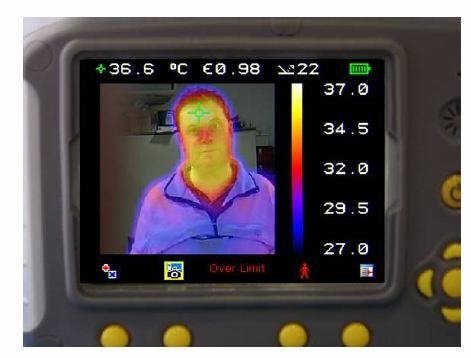 Note: that Surface skin temperature is lower than the internal body temperature. The product that IRISYS are offering for such initial screening, (not a diagnostics tool) is the IRI 2010. When a temperature in the scene exceeds the user defined threshold an alarm is flashed up on the camera screen and an audible alarm sounded. Additionally, the IRI2010 also incorporates a visual camera. This means that a person with fever will not only be detected, but by use of the visual camera that person will also be identified. This is particularly useful when screening groups of people. 2. Accuracy of measurement - IRISYS Spec. is +/- 2 deg. 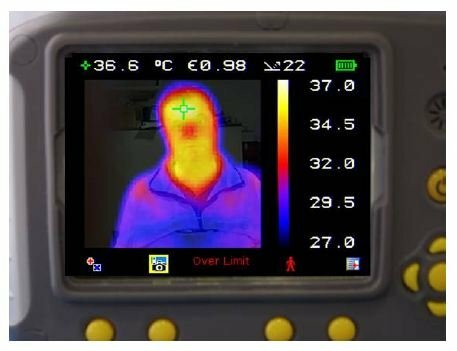 C.
Improved accuracy system - The easy way to improve the accuracy of a temperature measurement system is to have an external reference source in the field of view. 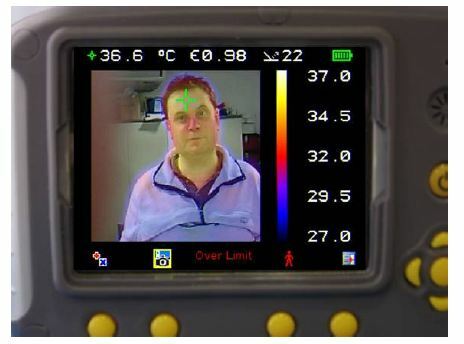 The imager can then measure the temperature of the reference source and a correction can be made on the human body temperature. A check could be made on the reference source every ½ hour or so. 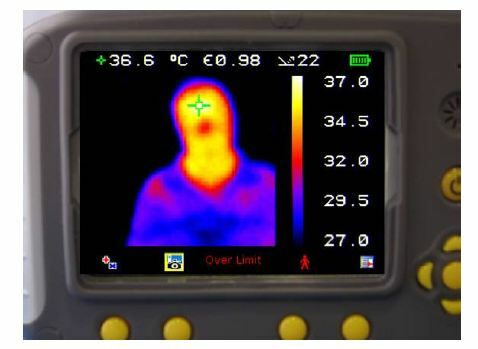 Examples of various blends of thermal and visual pictures showing a person with a temperature higher than the threshold set at 36°C. An audible alarm is also sounded through the Camera Speaker.